Haian Fu, PhD, has been named Chair of the Department of Pharmacology in Emory University School of Medicine, effective Sept. 1, 2017. 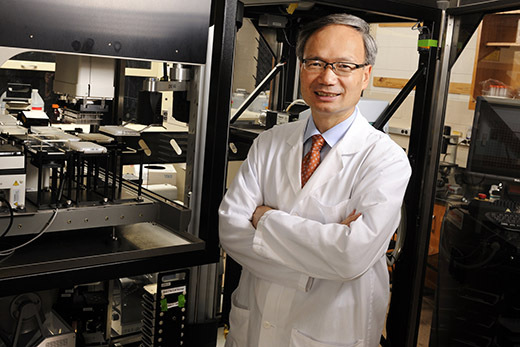 Fu joined the School of Medicine in 1994, and is currently serving as professor of pharmacology and associate dean for Innovation and International strategies. He holds additional roles at Winship Cancer Institute, serving as a professor of hematology and medical oncology, a Winship Partner in Research Endowed Chair, and leader of the Winship Discovery and Developmental Therapeutics Program. He directs the Emory Chemical Biology Discovery Center. Fu's research interests include cancer biology and chemical biology, with a focus on targeting protein-protein interaction networks in cell signaling for therapeutic agent discovery and translational research. He actively collaborates with physician scientists, chemists and disease biologists to advance research to benefit patients, contributes to national initiatives by serving on the NCI Cancer Target Discovery & Development (CTD2) Network steering committee and the NCI Chemical Biology Consortium steering committee, and leads a global effort in promoting chemical biology. Fu is a co-founder, past president and current chair of the Board of Directors for the International Chemical Biology Society. Fu is a recognized as a collaborative research leader with more than $30 million in federal funding as a principal investigator or co-principal investigator in the past two decades. Fu received his bachelor of science degree from Anhui University and his PhD from the University of Wisconsin-Madison, then completed a post-doctoral fellowship at Harvard Medical School and three years on the Harvard Medical School faculty, prior to joining the School of Medicine. Fu has effectively been serving as co-chair of the Department of Pharmacology since March, along with Ray Dingledine, PhD, and he will build on an outstanding department. Dingledine has held the role of Chair of Pharmacology for 25 years since joining Emory in 1992, with a simple but compelling vision of bringing cellular and molecular biological approaches to department research programs. He will continue this research in the department. "We look forward to Dr. Fu's leadership and ideas, as he works with pharmacology faculty and faculty across Emory School of Medicine and Emory University to leverage our programs in molecular pharmacology research and to advance therapeutics innovation and translational biology," says David S. Stephens, MD, interim dean, Emory School of Medicine. "We are grateful to Dr. Dingledine for his dedication to Emory and his exceptional leadership of the department."